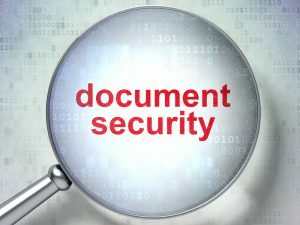 Every small business has to be concerned about document security. You want to make sure that sensitive documents containing information about your customers, financial information or other important data doesn’t get into the wrong hands. In certain industries, in fact, the law requires you to secure certain documents to protect customers. Here are five tips to improve small business security and keep your documents safe. In order to secure business documents, it’s necessary to get everyone who works for you on board with company policies. Here are some guidelines for effective practices regarding business and document security. Make sure people shred all sensitive documents rather than throwing them in the recycling bin. For added document security, invest in a high-end cross-cut shredder. When employees leave your company be sure to revoke their access to your files and network. Instruct employees to use strong passwords and never to share them with anyone. Employees should never leave their devices unattended without locking them. When they print out documents, make sure they retrieve them promptly. Communicate regularly with your IT department to review protocols on data security, encryption and other security issues. Securing files with passwords is one of the simplest ways to secure business documents but many small businesses fail to take this precaution. Programs such as Microsoft Word, Excel, Adobe Acrobat and other programs give you an option that requires users to enter a password to open a file. Remember to password protect files on your own computer and also when sending files such as contracts via email. Using electronic or eSignatures is not only more convenient but often more secure than scanning, printing and emailing documents to people in order to obtain a physical signature. It’s always a risk to send sensitive content using email. With eSignature services such as AdobeSign and DocuSign, it’s legal and safe to have documents signed digitally. It’s essential to scan all important paper documents and store them in a safe place online. With paper, there’s always the risk of fire or theft. The safest place to keep documents is in the cloud. Services such as Dropbox and many others provide you with ample storage for all your files. You can also set permissions to determine who can access or edit your files. Paper documents and receipts create clutter around your home and office. They also pose a security risk as someone can always find them. You can make use of the latest smartphone apps to cut down on all this clutter. Many stores now let you get your receipts emailed to you with apps such as Expensify. This saves you the trouble of dealing with paper receipts and the bother of having to shred them later. These small business security tips will help you maintain better security for your documents. Improving security is an essential aspect of running a successful business. Another important element is having sufficient cash flow. One of the best ways to enjoy enhanced cash flow is to use invoice factoring, a practice that lets you collect cash up front for outstanding invoices. To learn more, contact Riviera Finance.